This is an extremely versatile and super simple yet delicious flatbread. You can whip it up for a quick lunch or dinner or even serve as an appetizer. This has become a weekly staple in our house and I love it because you can switch up the flavors and ingredients. My favorite to make has a Mediterranean vibe - toasted naan, a layer of my Simple Homemade Hummus, topped with a layer of smashed avocado, arugula, sliced cherry tomatoes & fresh basil. It's then finished with extra virgin olive oil, balsamic vinegar & hemp hearts. I love all the different textures and bright flavors it provides. 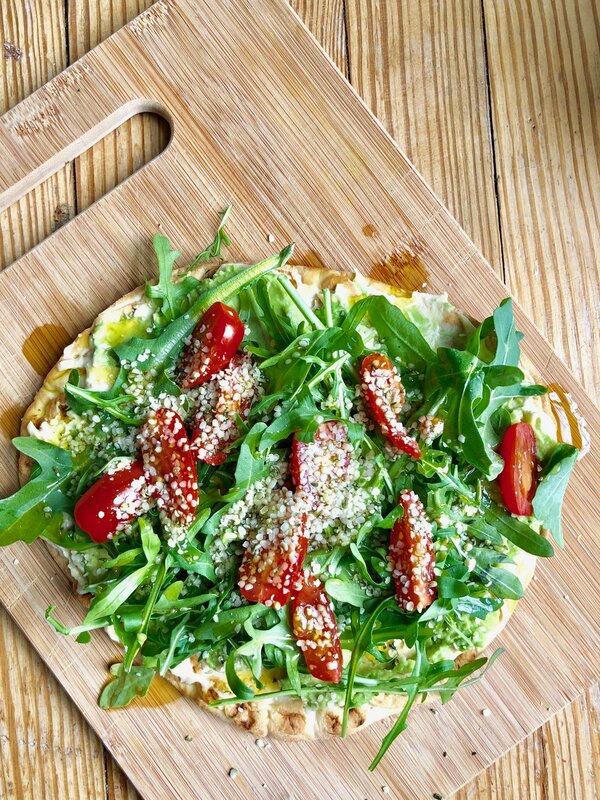 The creaminess of the hummus & avocado combined with the crunch of the toasted naan & hemp hearts is just so perfect. Light & fresh but still fills you up! Prep your toppings and set aside. Place the naan directly on the top of rack and bake until golden brown, about 8-10 minutes. Remove from oven and place onto a cutting board or baking sheet. Using a spatula spread on a layer of hummus and then top with the smashed avocado and spread evenly. Next, add the arugula, sliced cherry tomatoes, fresh basil & hemp hearts. Finish off by adding a healthy drizzle of extra virgin olive oil & balsamic vinegar. Cut into 4 pieces & enjoy! The perfect quick bite or dinner in a pinch!